Transcat can provide an accredited calibration for most of the products we sell ‚ before they leave the warehouse. Ensure that your brand new instrument is calibrated and ready to use the minute you open the box. We will calibrate most of the new instruments we sell in three days. The cost of rebuilding confidence with the company's distribution channels. Whether you operate in a regulated environment, need to meet the requirements of rigorous quality systems, or just want the security of knowing your instruments are getting top quality calibrations, you simply can't afford not to have Transcat calibrate your new instrument. You can count on Transcat to deliver quality calibrations you can trust. Transcat's quality systems are ISO 9001:2008 compliant, and we have earned the widest scope of ISO/IEC 17025 accreditation in the industries we serve. Your instrument will have documented accuracy that immediately complies with your quality systems and regulatory requirements from the day it arrives. Time needed to send newly purchased items out for calibration. Shipping costs to send new purchased items out for calibration. Administrative time spent receiving, shipping and paying another company to calibrate your new instrument. New items purchased with a Transcat New Instrument Calibration are ready to use directly out of the box. You are ready to work when the package arrives. The calibration certificate for your instrument is available online through Transcat's calibration management system, C3 , allowing you secure access to your instrument records anytime. We'll even send you a notice to alert you when your item is due for recalibration. 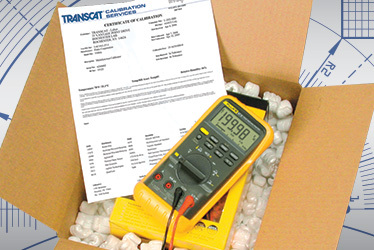 Transcat has several popular items available to ship the same day with a calibration. Call 800.828.1470 for details.